NDA Admit Card 2019 – Union Public Service Commission (UPSC) released the admit card of NDA 2019 exam on March 29, 2019. All candidates who had applied for the exam and their forms were accepted can download NDA Admit Card at upsc.gov.in from link below. It is mandatory on exam day to show hall ticket printout and photo identity mentioned in it. Roll number provided through UPSC NDA Admit Card shall be useful for checking result of NDA 2019. After exam, candidates can download answer key of NDA 2019 online. Get here complete details of NDA Admit Card 2019 including how to download it and solutions to common issues related to it. Latest: Admit Card of NDA 2019 is available for download; check link below. The document issued to applicants to inform their exam center and act as entry pass is the NDA 2019 Admit Card. Important dates related to it are as follows. Please keep your application form handy to refer registration number for admit card download. 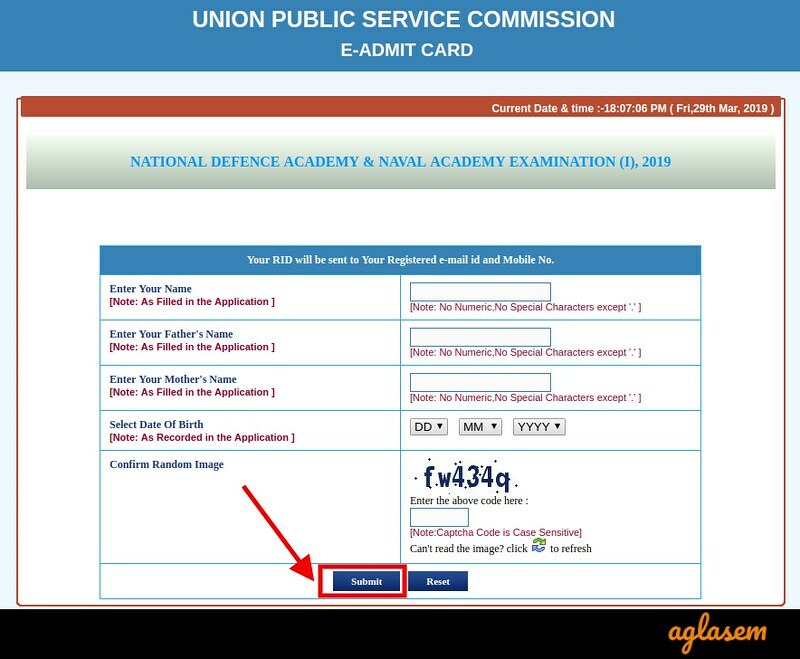 Download Here: Click Here to download NDA Admit Card 2019 issued by UPSC. How to Download the NDA Admit Card? 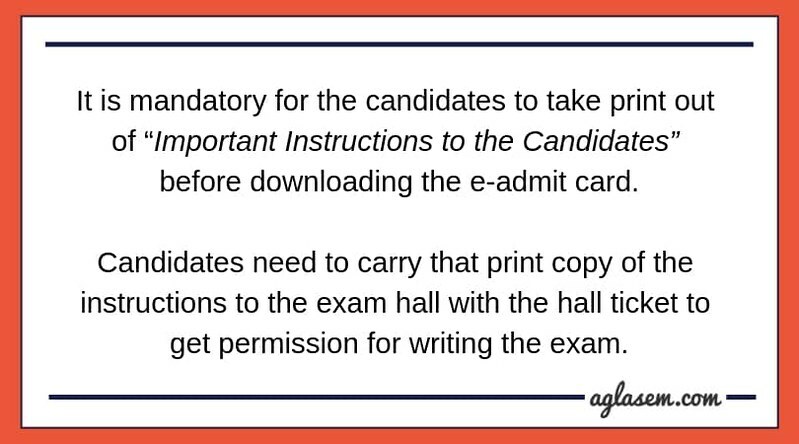 The candidates can follow the steps given below for downloading the NDA Admit Card. After downloading the admit card/call letter candidates should take the print out of it for future reference. Click on the above-provided link. The instruction page opens. Now print the instruction and click on the yes button. Thereafter, the login page appears on the new screen. In the login page enter the login credentials such as registration id/ roll number and date of birth. After mentioning all the login credentials hit the enter button. Thereafter, UPSC NDA Admit Card page will open. 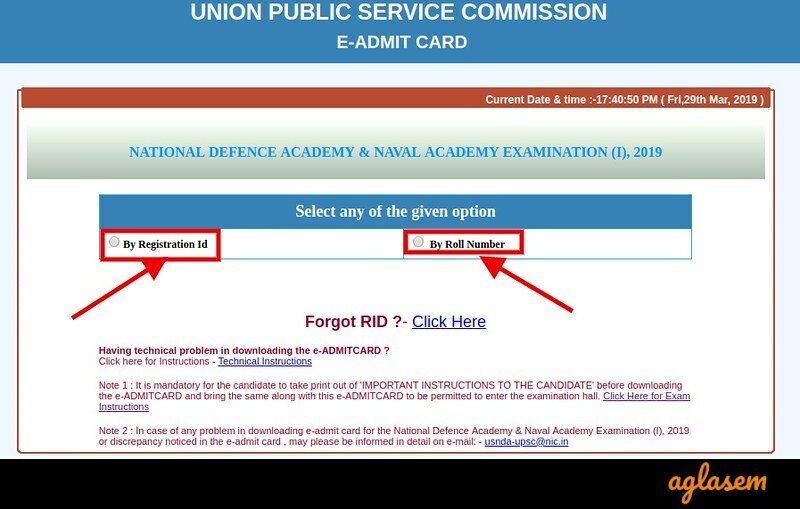 Click on the download option for downloading the NDA 1 Admit Card. Forgot Registration ID? Follow These Steps to Retrieve It! Click on the above-provided link. From the admit card login page click on the ‘Forget RID? – Click Here‘ link. In the next page, the candidates will have to enter the name, father’s name, mother’s name, and date of birth. After filling all the details, click on the ‘Submit’ button. The registration id will send on the registered mail id and password. What to do if Facing Difficulty in Downloading NDA Admit Card 2019? If the candidate is facing difficulty while downloading the NDA Admit Card 2019 then he / she should immediately contact at Facilitation Counter located in the Commission’s Office on 011–23385271 / 011–23381125 / 011–23098543 Extn 4119, 4120 or mail at [email protected] The candidates should contact the commission at least 1 week before the commencement of the NDA 1 2019 Exam. The candidates should communicate the commission by providing below mentioned particulars. Note: Candidates should note that the name in the e-Admit Card in some cases, may be shortened due to technical reasons. What to do if Received NDA Admit Card 2019 of Other Candidate? If by chance the candidate’s received other candidate e-admit card on account of a processing error, then he / she should immediately communicate to the Union Public Service Commission (UPSC) with a request to issue the correct NDA 1 Admit Card 2019. What To Carry and What Not To Carry on Exam Day? From below candidates can check the details regarding what to carry and what not to carry on NDA 1 2019 Examination day. If the candidates will not carry the required documents than those will be not allowed to appear for the NDA 1 2019 Examination. A hard copy of the UPSC NDA Admit Card. A print out of Important Instructions. From below candidates can view the details which will be mentioned on the NDA Admit Card. The below mentioned details should be mentioned correctly in the admit card. The NDA 1 2019 examination will be conducted in all across the country. The name cities in which the examination is going to be conducted has been provided below. UPSC does the allotment of the exam center while the registration process is on, on the basis of the first-apply-first-allotment basis. The candidate chooses the center of their choice, once the capacity of that particular center is full, then commission freezes the center. Then-candidate can’t choose the particular center. From below candidates can check the Important Instructions About the Exam. The candidates should follow instructions on the examination day. The candidates must reach the examination center as per the schedule is given on the admit card. Enter into the exam hall at least 20 minutes before the commencement of the exam. The candidates should carry black and blue ballpoint pen. Applicants should follow the instructions of the invigilator. The candidates who will qualify the written examination, those will be shortlisted for appearing in the SSB interview. The shortlisted candidate will have to first register for Service Selection Board (SSB) Interview. The candidates who will successfully register on time for SSB, for those applicants NDA SSB Admit Card will be issued. Candidates are required to report for SSB interview on the date provided to them in the call-up letter for interview. The SBB round is divided into two stages. In stage 1, Picture perception and picture description test will be conducted. The candidates who will qualify the stage 1 those will be shortlisted for stage 2. Stage 2 will consist of Interview, Group Testing Officer Tasks, Psychology Tests and the Conference. The duration of the SSB will be of 5 days. 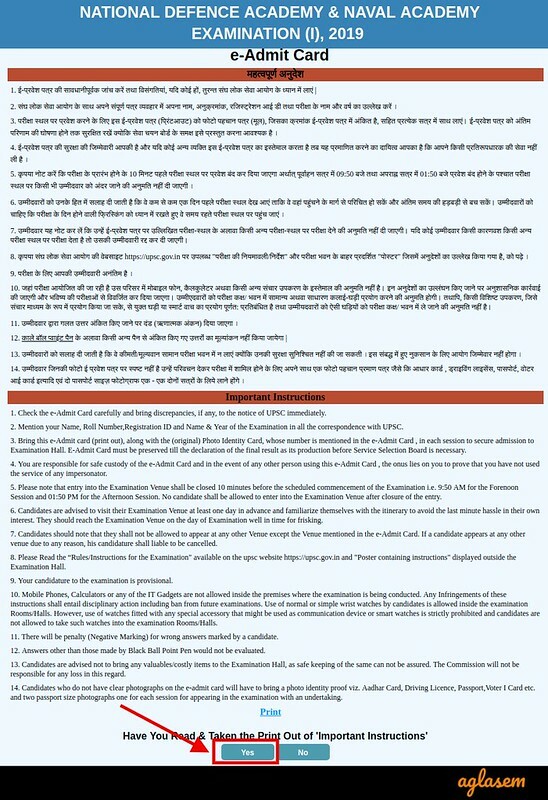 From below candidates can check the FAQ’s on NDA 1 Admit Card. If you have any doubt or question regarding admit card do comment below we will reach you soon. Ques. Request regarding the change of Centre/ Venue is accepted? Ans. No request for change of Centre / Venue will be accepted by the UPSC. Ques. 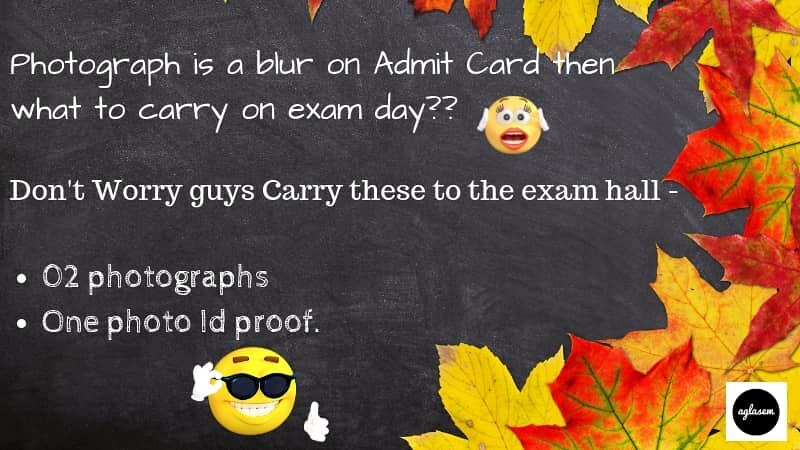 What do I Carry an original or xerox copy of photo id proof on the day of NDA Exam? Ans. Must carry both original and xerox copy of the valid photo id proof on the exam day. Ques. How do I correct a spelling mistake in NDA I Admit Card 2019? Ans. For any correction, you must contact the Facilitation Counter located in the Commission’s Office. Ques. From where can I download my NDA 1 Admit Card? Ans. The NDA Admit Card is available on the UPSC official website i.e. upsc.gov.in. Bennett University Admission 2019 Apply Now! !